The Workflo system is specifically designed to help you manage the challenges of providing surface engineering and thermal processing services to your aerospace, Nadcap, and high technology customers. This is an amazing software tool that will transform your planning and quality system. It probably sounds too good to be true. But, it is true. What makes it work is that, in addition to the software that creates the planning, we provide thousands of hours of data entry to define the requirements of the specifications. 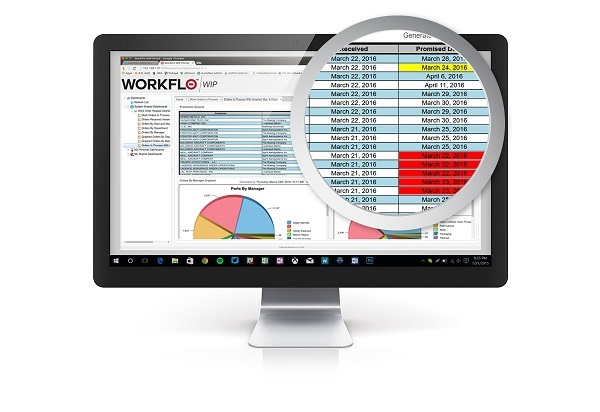 Workflo is our complete solution for your company’s work flow management. The program takes your parts door to door through your shop with accurate, real-time information and documentation. Workflo accounts for sales and quoting, certifications, shipping and receiving, vendor tracking, accounts receivable and much more. The Workflo systems are built with industrial strength open technologies, such as Java®, MySQL® and BIRT® (Business Intelligence Report Tool). Workflo conducts your entire operation – before the parts come into the shop until after the parts leave. The planning is always in sync with the current reality. Specification revisions, lessons learned and equipment changes are all constantly flowing down to the paperwork. Instead of several different versions developed over time, you have one plan that is always current and correct. Workflo/HT adds the heat treating requirements per the specification, material, condition and requirements allowing for up to date planning. Workflo/HT ensures all the operations and inspections for the routing are included, verified by Workflo/HT and contract review. Workflo/HT has a real-time option that accounts for best practices or purchase order changes. Workflo/MRO provides specification flow down by relating the specifications, materials and purchase order requirements with what you do. Workflo/MRO has special features built in to allow for the entry of specific information required by MRO shops. It also provides the ability to send specifications and other information to your outside vendors. Workflo/WIP makes visible the progress of each work order through the shop, providing useful dashboards and real-time reporting. The progress from the Workflo/WIP can be visible on the web for your customers with security to control what information they can view. The Workflo/WIP also allows this visibility for your whole team on a phone, tablet or desktop, giving everyone the view they need, when and where they need it.